Have you tried a brush in your skincare routine to apply those skincare products? My skincare game went up a notch since I’ve been using Sigma Beauty Skincare Brush set in my skincare routine. These Sigma skincare brushes feel so gentle (almost like gives a skin massage) while applying skincare products with them. Sigma Skincare brush set is another unique Sigma invention to get the most out of our favorite products and improved results. These brushes limit the absorbance and waste of skin care formulas compared to our fingers and hands would do during application. Also, these brushes were designed to apply products softly and with precision to avoid causing damage by tugging or pulling at the skin. Not to exaggerate but I’m sure you can see how gorgeous these brushes look! Not to forget that beautiful skin means happy mind and a perfect base for makeup! With what Sigma Beauty Skincare Brush /es made of? Sigma says that these skincare brushes are made with non-toxic material and high-grade silicone. The fibers of these brushes are exclusive synthetic, antimicrobial fibers. These fibers are flexible and smooth to server proper skin comfort. Ferrules of these skincare brushes are durable, corrosion-resistant SigmaAlloy ferrules. They are coated with precious-metal plating for shine and strength. Each of Sigma skincare brush has a solid, polymer-based handle. Sigma Skincare brushes are waterproof and cruelty-free. Formulated without: Latex, BPA, Lead and has a FREE 2-year warranty! This brush set includes 6 brushes designed (patented) for different skin care products to give the best feeling while pampering skin. Sigma also says that these brushes assure hygiene and less use of the product to get a gorgeous complexion. I’ve been using this Sigma moisturizer brushes the most among all 6 Sigma Beauty skincare brush. This works really well at spreading moisturizer all over the face. The brush bristles are really soft on the skin and the angle shape helps to reach at every curve the face. It feels truly amazing applying the moisturizer with the S05 moisturizer brush. I’ll be straight honest for this S10 serum brush. The brush is made of duo fiber bristles to spread the serum evenly. But unfortunately, the bristles poke my skin too hard (I meant to say the brush feels super scratchy on the skin when wet by the serum if I’m making any sense). I stopped using this Sigma serum brush after the first use. This brush alone is a disappointment of the bunch. Although I really wanted to love it as much as I love other skincare brushes of this set. I’m using the moisturizer brush S05 for my serum as well before applying the moisturizer. It works for the serum just as good. I was skeptical about the eye cream brush. Surprisingly, it’s turned out to be one of my favorite of the skincare brush set. It is really nice and soft even for the delicate eye area. The curve of the brush literally gets into every corner of the eye that my fingers wouldn’t reach properly. I apply and spread my eye cream with this brush and then follow up with my FOREO IRIS Eye Massager for a minute. I don’t customize my skincare much often so I’ve been using the Spatula brush the least. So far I’ve used it to mix my eye cream with a targeted solution that I’ve been trying out recently (The Ordinary EUK 134 0.1%). I’ve been using the Sigma spatula to apply my spot correcting cream(Mamonde AC balance Spot Serum) on the tiny spots of my face. It picks up the right amount of product and worked well applying it. It’s also a great skincare tool for getting products/creams out of their jar in a hygienic way without dipping my fingers in. I love this brush. I’ve been using a GlamGlow mask brush (that I got in a gift set of theirs) to apply any kind of mask. Needless to say, that brush wasn’t really good enough to pick up a gel mask. Sigma definitely nailed it making each of this skincare brush. The S15 Gel Mask brush is a really good brush to pick up a gel mask from the jar. The gel mask brush also feels smooth and soft on the skin while applying the mask evenly on the skin. I’m using this S01 Clay/Mud spatula for my every clay mask session ever since I got the Sigma Skincare Brush set. Without a doubt, this is a must-have for a neat and mess-free mud mas application. It is so easy to pick up a clay mask from the container (tube or jar) and to spread the mask all over the face. Why you should use Sigma Skincare brushes? Do you really maintain skin care hygiene? Don’t you sometimes forget to wash hands before applying skincare? Especially when you take a 5 to 10-minute break during a skincare ritual. If I ask myself the questions above and If a be truthful to answer you – yes I do forget maintaining proper hygiene. Sometimes I don’t even think before dipping my finger into a skincare jar. Hello, I am a human being and I obviously can’t be perfect! I’ve always felt the need for some proper skincare tools. When came across the launching news of Sigma Beauty skincare brush set it (literally) felt like a wish comes true! After giving all 6 skincare brush a good use I found them very useful. I got rid of that scary thought of forgetting to wash my hands before my skincare. It takes way less time for the products to absorb with the brushes compared using my hand. With the brushes, I also need way less product to cover my whole face. Additionally, my skincare routine feels luxurious with Sigma skincare brushes. Are you thinking if it’s still worth investing on Sigma Skincare brush set? I totally understand your confusion. I was hesitant as well when I was making the decision to purchase. I added the set in my cart just the day Sigma Beauty released it. But I was taking my time to check out. In the meantime got lucky that Sigma Beauty sent me one to try and review. I’m sure you already know I’m a sigma beauty affiliate but I don’t hesitate to buy any product that I like myself. These skincare brushes definitely fall into a luxury item. You DON’T NEED them, you can totally survive with these brushes. Then again, you DO NEED these skincare brushes. – Just the way we need a luxury retinol serum or maybe a vitamin C serum before our moisturizer even though the moisturizer we are using probably already claim to have hyaluronic or other beneficial ingredients in it. Am I making any sense to you? What I’m trying to say is, Sigma Skincare Brush Set is just like all luxurious item that gives special benefit. They are genuinely useful once you start using them. They make skincare more sanitary, fun and effective. How to clean Sigma Beauty Skincare Brush? This thought came into my mind first. Sigma Beauty also suggests washing these brushes before every use. If you don’t keep the skincare brush properly clean the whole hygiene purpose fails. You must keep skincare brushes clean before every use. However, I clean them after every use. It feels easy to me that way and I like to start with a dry brush. Don’t get underwhelmed. It is super easy, takes hardly a minute to clean a Sigma skincare brush. These skincare brushes also dry faster than a regular makeup brush. It gets easier if you have a brush cleaner like Sigmagic Brushampoo or the Sigmagic Brush Scrub. I clean all the brushes with the Sigmagic Brushampoo and then hang then in my Sigma Dry’n shape tower. They take approx. a couple of hours to get fully dry. I also store my skincare brushes in a box that has a lid so no dirt gets inside. My overall thought about Sigma skincare brushes? I simply love sigma skincare brushes except for the serum brush because it feels pokey on the skin. If there was an option to buy these skincare brushes individually then I would surely buy the moisturizer brush, Cay/mud mask brush, Eye cream Brush and the gel ask brush for sure. Maybe I would consider the spatula as well however that can be substituted by the eye cream brush if you want. All these skincare brushes deliver on its promises. I have got a feeling that Sigma skincare brushes make me want to spend the more time pampering my skin. It feels kinda having a skincare spa at home! If you don’t mind stepping up more on the luxury skincare routine then I’d definitely recommend this skincare brush set to you. 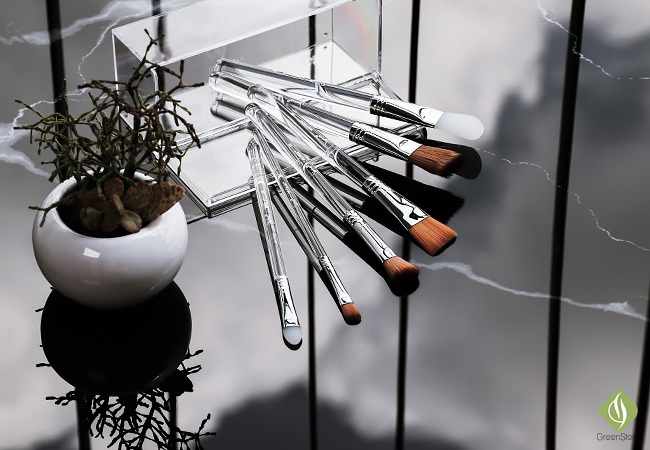 Shop this skincare brush set directly from Sigma Beauty website. You can always get a 10% off using the code ‘GreenStory’ at checkout. Practk Power Blender | Affordable makeup blending sponge that you can count on! Eucerin ProACNE Solution | Anti-Acne moisturizer for acne-prone skin - does it work? KLAIRS Freshly Juiced Vitamin E Mask | Really gives Bright & Glowing skin overnight? Receive weekly HOT content directly in your mailbox and it's FREE. © 2019 GreenStory - All Rights Reserved.